A couple of days ago, Sidepodcast dot com was kind enough to mention me in his post entitled The FIA Transcripts (Part 2). It is stated that I am less interested in the details that emerged in the meeting but that is a slight exaggeration. I am interested but feel that they are less important than the matter of the legitimacy of the WMSC's findings. At the risk of boring my readers, who must be thoroughly fed up with F1 politics by now, I must mention one detail that I find very revealing as to the suitability of the WMSC to judge the issue before them. It arises in the brief exchange regarding movable floors, a strange interlude that occurred during the examination of Paddy Lowe. 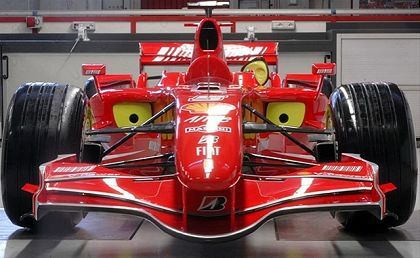 The Ferrari lawyer, Nigel Tozzi, is at pains to prove that the Ferrari cars were not illegal during the Australian GP and he attempts this by reference to article 3.17 of the regulations, an article intended to clarify the earlier article 3.15. There is some discussion as to whether anything can be totally rigid but this is just fudge; the intent of article 3.15 is quite clear - the floor of the car must not flex. "I do not think that anyone on the World Council would seriously consider that the Ferrari device was illegal at the time, any more than the Renault mass damper before it was eliminated." "The test described in Article 3.17.4 is intended to test the flexibility of bodywork in that area, not the resistance of a device fitted for the purpose of allowing the bodywork to move further once the maximum test load is exceeded. "We have no objection to a device in this area which is fitted to prevent the bodywork from moving downwards, provided it is clear that it is not designed to circumvent the test described in Article 3.17.4." Charlie is the ultimate FIA authority in technical matters; it is to be presumed, therefore, that he knows what he's talking about when it comes to complying with the regulations. And he makes quite clear that it is article 3.15 that matters, 3.17 being merely a description of the limits that the FIA test will run to. Flexibility beyond those limits is still illegal, even if undetectable by the existing test. The inescapable conclusion must be that the Ferraris (and the BMWs and anyone else circumventing the test in this way) were illegal at the time of the Australian GP. The whole business is irrelevant to the case before the WMSC at the time but it does illustrate rather nicely the inability of the committee to understand the FIA regulations. It is not for me to question Max's motives in choosing to interpret the matter in a way that suited Ferrari at the time; that I leave to you. In fact, I would ask how we can seriously consider fitting a verdict that convicts on the grounds of supposition and inference when the body delivering that verdict has obviously fudged a much clearer issue that did not serve their purposes. I only ask because I want to know. apologies for misinterpreting your initial take on the transcripts. for me the primary interest was - what could i glean about car setup, aero revelations and general team insider information, i figured that most people were less geeky than me. plus, i couldn't really introduce your post by saying - please read clive's thioughts because he's a whole lot smarter than us, could i? But I protest at your last sentence. We are all very smart in our chosen specialities, I'm sure, and I wouldn't have the first clue about how to make a podcast! "were not illegal during the Australian GP"
And I graduated so many years ago that I can't remember a thing! As you have admitted to breaking a rule I suggest a 100million dollar fine. Your posts will also be scrutinized before posting is allowed on anything dealing with the 08 season. And in the finest spirit of F1 blogdom, I convict Max Mosely (Dan) of incredible stupidity, short-sightedness and exceeding due jurisdiction.